Most payment service providers are smart enough to be on the lookout for rogue merchants selling steroids or SARMs for use in bodybuilding. But what they may not be aware of are merchants selling synthol, a potentially dangerous injectable masquerading as a harmless topical. Although synthol and other products like it have been around for years, LegitScript has seen surge in merchants selling this product used by bodybuilders to boost the cosmetic appearance of muscles. According to the National Institutes of Health, synthol typically consists of of 85 percent medium-chain triglyceride oils (a fatty acid), 7.5 percent lidocaine (a painkiller), and 7.5 percent benzyl alcohol (a sterilizer). It falls into a category of products called site enhancement oils (SEOs), which are typically marketed online as “posing oil” to be used topically. For this reason, they frequently pass under the radar of PSPs and e-commerce platforms. However, synthol and other SEOs such as paraffin, sesame, and walnut oils are frequently purchased for use as dermal fillers to create artificial muscle mass. When injected, the oil expands and hardens inside the body, resulting in a rocklike texture and appearance, which often must be drained or removed surgically. The ingredients in synthol have not been analyzed by the FDA for use as a dermal filler, in part because it is marketed for topical use. Furthermore, the FDA has not approved any dermal fillers for large-scale body contouring or for implantation into tendons, ligaments, or muscles. This lack of regulation poses major risks for those who inject it, as these products may contain toxic ingredients. Self injection without the supervision of a medical professional may increase this danger. 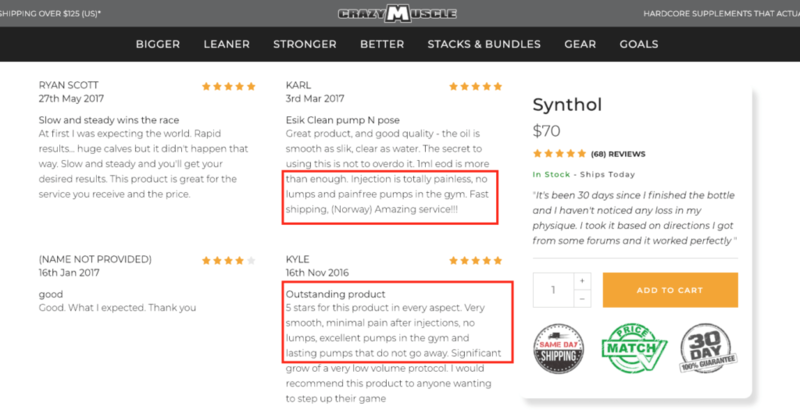 Even though many fitness and bodybuilding platforms warn their communities about the risks associated with synthol, LegitScript still sees new websites and merchants regularly appear. What are the Risks Associated with Synthol? What Should PSPs and E-commerce Platforms Look Out For? Most merchants selling synthol should raise a red flag, especially if they sell the product exclusively. Product descriptions of “painless technology” or “pharmaceutical-grade ingredients” may warrant closer scrutiny. If merchants offer “discreet shipping,” that also is a cause for concern. Perhaps the most useful indicators are the comments sections of websites. 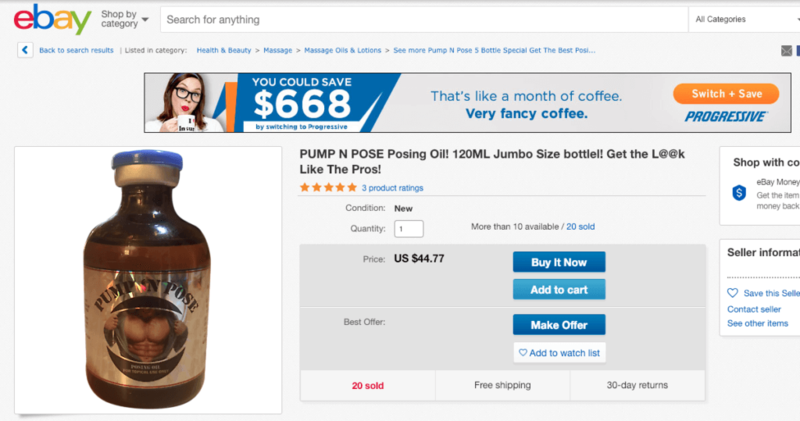 For example, the following website states that its synthol product is intendedly purely as a topical posing oil, but it also describes “dramatic and instant gains.” User comments explicitly describe synthol injection. Merchants offering synthol and other SEOs for injection are at risk of regulatory action, and PSPs and e-commerce platforms that allow these merchants may face expensive fines. 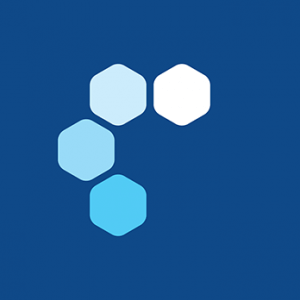 Want to know if your portfolio or platform contains merchants selling unapproved injectables? Alongside the world's largest database of problematic products, LegitScript has a team of leading experts that keeps abreast of trends such as synthol and tracks the regulatory and card brand trends that follow. Contact us to learn more.